Copper, Dissimilar welding, GTAW, Weldability. As the development of metallurgy continues, the welding of dissimilar materials are increasingly on the demand as engineers are finding creative ways to optimise solutions in the manufacturing field. Areas where the focus of this study are found in the automobile and aerospace industry, power generation applications, and pressure vessels . An example where the weldability of copper is becoming more prevalent is in the automobile industry. The current market for the automobile industry is tending towards designing lightweight vehicles and electrification of motors as fuel prices are continuingly increasing. However, producing an efficient induction motor for a vehicle is proving to be difficult as copper not easily weldable. The current fabrication of the induction motor uses aluminium squirrel cages which does not have the same conductivity as copper . The welding of two dissimilar materials poses a challenge to manufacturers . Each metal has different thermal properties, chemical properties, and mechanical properties. The greater the difference, the greater the difficulty involved with welding of the two materials . The aim of this paper is to explore the practicality of welding copper and mild steel with GTAW process without a filler. Limited research has been conducted previously on this subject. Velu and Bhat  investigated alloy steel (EN31)-copper (UNSC 110000) welding using a bronze and nickel-base superalloy filler materials. Shielded metal arc welding was the joining process and the thickness of the plates were 10 mm with welding edge beveled to 30°. The welding parameters were preheated copper to 540°C and they varied the speed and power input per test. The results of welding with the bronze filler showed weld porosity, poor mechanical properties and splattered along the weld. The results of the nickel filler showed comparable strength to copper and quality of weld was adequate. Shiri et al. studied GTAW process of CP copper to stainless steel using different types of filler metals. With the Ni-Cu-Fe filler, a uniform weld zone was produced but at the copper interface, voids were found due to high cooling rates and entrapment of gases in the weld zone. Chromium and Nickel may extend the copper solubility of copper in iron but high cooling rates restrict the uniform distribution. The copper based filler produced no macroscopic defects. The stainless steel filler metal failed to fully fuse on the copper interface. Lin et al. investigated the differences between GTAW process and friction stir welding (FSW) process on pure copper. GTAW produced elongated grains and the cause of this was due to the rapid temperature changes. The microstructure for GTAW showed a visible boundary between the weld zone and HAZ. In the weld zone, large grains were observed. Defect features were also seen in the GTAW process as cracks and holes. There are also other studies on welding of copper and mild steel, but with different welding techniques [1,8,9]. Majority of past research had been focused on advanced welding techniques or GTAW with different filler materials, therefore it was necessary to provide research for an arc welding process without a filler metal. The overall aim of this paper is to explore the practicality of welding copper and mild steel. Copper is not the easiest metal to weld but has potential to cut manufacturing costs, optimise the uses of materials, and improve the efficiencies of devices. The applications for it are increasingly on demand whether it is welded to alloy steels, aluminium or titanium. To define the weldability of copper, several GTAW tests were carried out as well as metallurgical investigations after welding. Tensile, bending and hardness tests were also conducted to observe the strength of the overall weld area. The bending test was used to observe for any surface defects and evaluate the ductility under pressure. The metallurgical investigation involved preparation of specimens to be examined by optical microscope and the scanning electron microscope (SEM). Samples for tensile and bend testing from the welded copper-mild steel sheet were cut with a wire cutting machine to ensure a minimum heat generation due to cutting. The transverse tensile testing followed the dimensions of a sub-sized dog bone based on the American Society for Testing and Materials (ASTM) International (ASTM E8/E8m – 09). The purpose of this test is to provide information about the strength and ductility of the weld joint under a one dimension tensile pull. For this investigation, two sub-sized specimens representing as-welded and post welded heat treatment (PWHT) were tested. Hardness tests followed the Standard Test Methods for Knoop and Vickers Hardness of Materials (ASTM E384-10). The Vickers diamond hardness test is common to be used for testing of weld metals. It measures the properties of the weld metal and give evidence how the welding process has affected the base metals due to heat affects. The settings for this test was a dwell time of 10 seconds and a load of 200 – 300 gram force. The bending tests followed the Destructive tests on welds in metallic materials – Bend Test in accordance to ISO 5173:2009. The purpose for this test is to not obtain quantitative results but to evaluate the ductility of the weld under pressure. It reassures the tensile tests that the joint is fused properly with adequate mechanical properties and defect free. Metallurgical investigations were also conducted to reveal the microstructure of the grain structures of the weld zone and reveal any defects, if any. The procedure to prepare the specimen for metallography followed the Standard Practice for Preparation of Metallographic Specimens (ASTM E3 – 95). Etchant number 26 and 31 were used based on ASTM E 407 – 07. The process of welding always involves residual stresses because of the thermal expansion and contraction of metals. A method to relief the stresses by redistributing is post-weld heat treatment (PWHT). The objective of PWHT was to attempt to soften the weld metal, relief the stresses, and increase the tensile strength of the copper HAZ. The PWHT was conducted at 970oC for 30 minutes followed by forced air cooling to room temperature, and then ageing at 520oC for 2 hours followed by air cooling. Figure 1 is a stitched image of the copper-steel weld profile at five times magnification. The area in focus shows the fusion zone and the HAZ of copper. From the very left hand side of the image shows the grains of copper. The closer the grains are to the fusion zone, the larger they get. The fusion zone heat is what causes the growth of these grains and is called recovery, recrystallization and grain growth. The copper plates would have been rolled to form the thin plates and this is a cold worked process. It is the internal energy stored during this process that allows the growth of new grains through recovering grains. However for the grains to grow, time and temperature are variables that promote the growth. The grains start growing as small nuclei and grow until they cover the entire metal. Regions close to the fusion zone are subjected to the most heat and longest period of time at elevated temperatures and as a result this has allowed for the grains to merge together to form large grains. The further away from the fusion zone, the decrease in heat and time reduces the rate at which these grains grow. As the growth of these grains grow from nuclei to large grains, what tends to happen is that the metal will have a relatively high tensile strength and low ductility at the nuclei. The large grains on the other hand will have high ductility and low tensile strength. Figure 1: Optical micrograph of copper-steel weld profile. Note Cu on the left and steel on the right. Looking at the interface of the copper and weld metal, the feature observed is a saw edged shaped interface. From this image, a distinct fusion line is unclear and the extent of mixing cannot be scientifically evaluate at this stage. However due to the irregular interface of the copper and weld metal, this suggests that the melting of the copper was irregular. The use of the SEM would be able to show the mixing of the copper and weld metal interface Figure 2A. Phanikumar et al. revealed a similar interface with the use of the laser welding process. Their study found that the interface of the copper and weld metal showed areas where there were mixing and no mixing. A composition analysis showed a high percentage of copper after fusion line and a sudden drop to approximately 25%at of copper. Viewing the steel and weld metal reveals a clear interface line. It appears that steel melted evenly resulting in the liquid metal penetrate towards the base metal. Further down the weld, a feature is seen where the liquid metal laps beneath the steel base creating a tooth like feature of iron. Figure 2: Microstructure images with SEM and optical 20x magnification. (A) Cu-weld metal interface, (B) Bandings near surface, (C) First banding near Cu interface, (D) Wave ripple banding, (E) Weld metal-steel interface, (F) Weld metal-steel interface near root, (G) PWHT weld metal steel interface, (H) 50x magnification of PWHT weld metal-steel interface. Figure 2C and D shows two distinct structures in the weld metal, dendrite and cellular. The growth of theses cellular structures can turn into dendritic structure as a result of changes of the temperature gradient, speed of welding, and growth rate. Significant changes in any one of these variables will lead to different structures and sizes of the microstructure. As a results, banding features are seen and is a direct effect from microsegregation. There are at least three bandings seen in the weld profile, two are easily identifiable in Figure 2B and D and the other one is more subtle to identify but is visible through SEM. Two of the banding features can also be referred to a band ripple because of the nature of the shape. The composition of these features appear to be rich in ferrite resulting in more copper to be rejected to the liquid metal. The effect of these bandings will not be significant to effect the overall structure of the weld but may affect the corrosion resistance. With any welding process, the conditions are always non equilibrium due to the cooling rates involved from the surroundings of the weld. Figure 2E and F shows an interesting feature in the direction of the dendrites. They appear to be all face perpendicular to the interface of the steel. This feature is a result of a stagnate layer at the interface of the base metal and weld metal called the partially mixed zone (PMZ). It is more identifiable on the steel side because more melting occurred than the copper interface. The reason for this stagnate layer is due to friction effects of a liquid and solid. For continuity, both must move in the same velocity. The solid will not be moving therefore the liquid at the interface cannot move, remains un/partially mixed, and ferrite rich. Unfortunately the PMZ generally has undesirable phases leading to poor characteristics. There is no method to completely remove the region due to effects of nature but there are ways to minimise the formation by introducing convection in the weld pool or use narrower welding processes like laser beam welding. The benefits of using the SEM are to identify features that the optical microscope can fail to pick up. Figure 2F demonstrates this because porosity can be seen in this weld. This will degrade the joint and could be a source for fatigue failure. Figure 2G and H show the effects of the heat treatment weld metal and steel interface. The post weld heat treatment appeared to help redistribute the dendritic structure. The structure near the interface of the steel appear to be wavy than the previous. The growth of the dendrites may have resulted in the cellular like structure (some equiaxed). More bandings can be seen on the copper side as a result and a dendritic structure only exists on the copper side. The copper interface is less rugged. The tensile tests of the copper-steel weld fractured in the HAZ of the copper size for both as welded and PWHT specimens. The as welded sample fractured approximately 0.8 mm from the rough interface whereas the heat treated sample fractured approximately 3.4 mm away from the interface. Both fractured at 45° and this suggest that maximum shearing occurred. The results of the tensile test confirms that the weld metal and steel were much stronger than the copper. This lead to fracture in the weakest metal and in this case was the copper. Post weld heat treatment failed to increase the strength of the joint. What had occurred during the treatment was growth of the copper grains which lead to low strength and an increase in ductility. The procedure itself actually weakened the tensile strength of the joint. Due to the nature of fracture, it is uncertain what effect of the heat treatment had affected the strength of the weld metal. From these results, post weld heat treatment is unnecessary for this type of joint as the strength deteriorated in the copper region. Instead it increased the elongation 10.5% from the as welded fracture results. The summary of tensile tests results are presented in Table 1. Table 1: Summary of tensile tests results for as-welded and PWHT copper-steel weld samples. Three sets of micro hardness data were taken from on the surface and across the weld of the as-welded profile, and PWHT weld profile as shown in Figures 3 and 4, respectively. Referring to Figure 4, the micro hardness testing for the weld profile as welded showed that the copper base hardness was unaffected by the heat of the welding process. It produced an average Vickers hardness value of 63HV. The same can be said with the steel side with an average of 123HV due to the low carbon content. The weld metal on the other hand produced the highest hardness with an average of 173HV. This suggests that the entire weld metal is stronger, hence, less ductile. The results for the surface hardness of the joint are similar to the weld profile. The results of the PWHT sample revealed a similar graph to the as-welded weld profile. The copper side had an average hardness of 95HV, weld metal 167HV, and steel 119HV. The effect of the heat treatment for the steel side and weld metal had no significant differences in hardness value. Only a slight decrease in hardness which suggest the treatment has increased the ductility of the weld metal. 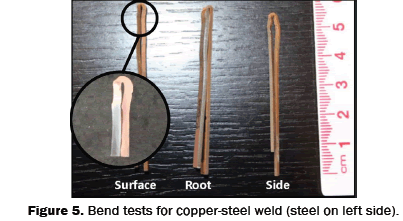 From bending tests, the results showed that the specimens were bent around the copper HAZ and this confirms that copper still had the highest ductility (Figure 5). Approximately 0.5mm from the copper interface was the convex of the bend. Visually looking at the specimens, the surface and root bent samples appeared to have small cracks along the convex surface. The side bent sample failed to reveal cracks that can be seen with the unaided eye. Looking at the outline of the shape, the top surface was rounded except at the weld metal. A sharp corner was seen between the weld metal and copper base metal. It was seen from the bending tests that copper base metal covered 70% of the bend. The purpose for this test was to reveal any significant cracks and ductility. With any cracks detected, it will cause the lifetime of the weld to decrease. The cracks can lead to failure of the part due to fatigue, thermal expansion, and contraction. Ductility of the weld metal could not be scientifically performed but the nature of the modified bend test suggests that weld metal was relatively brittle. 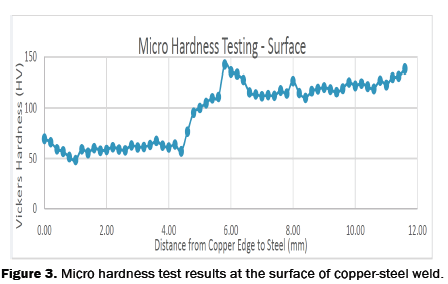 Figure 3: Micro hardness test results at the surface of copper-steel weld. 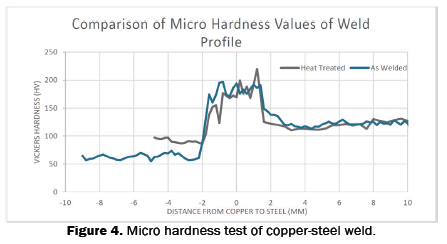 Figure 4: Micro hardness test of copper-steel weld. Figure 5: Bend tests for copper-steel weld (steel on left side). The image of the fracture surface from the as-welded sample using the SEM is shown in Figure 6. There were two failure modes observed. The area on the right revealed ductile fracture surface with dimples and cone like features. These features are a result of plastic deformation before failure. The brittle fractured surface was seen on the left (more towards the weld metal) without indication of plastic deformation and a flat surface perpendicular to tensile stress direction. These features were more prominent in the area closer to the weld metal. Figure 6: Fractured surface of the as-welded copper-steel following tensile test. Another feature that can be seen is a defect in the welded zone. A significant gas pore can be seen in the image and measures to be less than 150 microns. This suggests that there may have been hydrogen introduced in the weld creating the gas pores. This defect is significant and degrades the entire weld quality resulting in a lower quality weld. SEM image of the PWHT is given in Figure 7. The metal was highly ductile compared to the as-welded sample. There was no features of brittle properties nor any identifiable defects. This results confirms that the heat treatment lead to an increase in ductility of the copper section. Further grain growth lead to lower tensile strength resulting in fracture on the copper section. Figure 7: Fractured surface of PWHT copper-steel weld facing copper base. Mild steel and copper welded together using GTAW process. Limited and uneven melting was seen on the copper interface leading to a rugged edge. A smooth interface on the steel boundary represents uniform melting. The microstructure of the weld metal revealed dendritic structure and cellular structure. The formation of these two are a direct result to thermal fluctuations in the weld. This leads to macro-segregation and micro-segregation causing bandings to occur. Overall the structure was more dendritic. No grain growth from either side of base metals were seen to grow into the weld metal. The chemical composition of the structures in the weld metal revealed to be ferrite rich and can be associated with the coring effect. The composition was 81.6 at % ferric rich. The phase diagram reveal the dendrite phase was eutectoid of α+ε. Tensile test results revealed failure at the copper HAZ with an ultimate tensile strength of 220 MPa. Fractography revealed both ductile and brittle failure. PWHT failed to improve properties of overall weld due to copper being more ductile as a result of treatment. The ultimate tensile strength of the PWHT was 138 MPa. Fractography of PWHT weld showed only ductile features. The average Vickers hardness for copper was 63HV and for mild steel 123HV. Peak hardness was achieved on the weld metal with an average of 173HV and suggests less ductile properties. PWHT revealed the weld metal average hardness of 167HV, and steel 119HV. This suggests slight improvement on ductility of weld metal. Bending tests suggests higher strength at weld metal compared to the copper side. Surface cracks were revealed for both surface and root transverse copper-steel welds. Yao C, et al. Interface microstructure and mechanical properties of laser welding copper–steel dissimilar joint. Optics and Lasers in Engineering. 2009;47:807-814. Agapiou J S. Inertia welding for assembly of copper squirrel cages for electric motors. Journal of Manufacturing Processes. 2014;16:276-283. Bina M H, et al. Effect of heat treatment on bonding interface in explosive welded copper/stainless steel. Materials & Design. 2013;45:504-509. Magnabosco I, et al. An investigation of fusion zone microstructures in electron beam welding of copper–stainless steel. Materials Science and Engineering: A. 2006;424:163-173. Velu M and Bhat S. Metallurgical and mechanical examinations of steel–copper joints arc welded using bronze and nickel-base superalloy filler materials. Materials & Design. 2013;47:793-809. Shiri S G, et al. Gas tungsten arc welding of CP-copper to 304 stainless steel using different filler materials. Transactions of Nonferrous Metals Society of China. 2012;22:2937-2942. Lin J W, et al. Comparison of mechanical properties of pure copper welded using friction stir welding and tungsten inert gas welding. Journal of Manufacturing Processes. 2014;16:296-304. Mai T A and Spowage A C. Characterisation of dissimilar joints in laser welding of steel–kovar, copper–steel and copper–aluminium. Materials Science and Engineering: A. 2004;374:224-233. Phanikumar G, et al. Characterization of a continuous CO2 laser-welded Fe-Cu dissimilar couple. Metallurgical and Materials Transactions A. 2005;36:2137-2147.